It’s that time of year again, the time of year where tons of men and women gather in fancy clothing on the red carpet for the Oscars (officially rebranded as such in 2013). The history of the Oscars starts at the Roosevelt, where the Blossom Room was the location of the first Academy Awards in 1929. It was during this ceremony that the first Oscar was given to Emil Jannings, a Swiss-born German/Austrian actor. Back then the ceremony was small and short; less than 270 people were in attendance and the actual ceremony was a whopping 15-minutes long. Emphasis was on networking with other people in the industry. To me, this seems like a manageable experience. However, because everything in Hollywood seems to have some sort of plot twist or scandal, author Susan Orlean found evidence to show that the actor to receive the most votes for Best Actor in 1929 wasn’t actually Jannings, but rather Rin Tin Tin. But, the Academy was reluctant to give the Best Actor award to a dog because they felt that no one would take the Oscars seriously after that. In another twist, Jannings would later go on to star in Nazi propaganda films and was renounced by Hollywood. For the years following the first Academy Award, a variety of venues were used for the ceremony, including the Ambassador Hotel, the Biltmore, Grauman’s Chinese Theater, and the Pantages Theatre. In 2002, ceremonies were moved to the current location at the Dolby Theatre. The photo below is of the theatre from the bottom of the steps that lead to the entrance. I walk these stairs every day and wonder if businesses have to shut down in the Hollywood/Highland Mall on the day of the Oscars… or if they stay open so actors/actresses can run into Kelly’s for a quick gelato before the ceremonies. In the two weeks approaching the ceremonies, the Boulevard was mired in chaos and construction… and it de-evolved rather quickly. Two weeks earlier, all the building materials arrived and the side streets were no longer easily passable for cars or pedestrians. A week later, the sidewalks along the Boulevard were cut in half. This was a complete benefit to the aggressive and passive aggressive motherfuckers who try to peddle their CDs, Tussauds discounts, tours, photos, and other garbage. Now they had a funnel from which they could harass and insult every single person walking along the Boulevard. Next, the Boulevard was shut down. This made locals extremely grouchy. This problem was only exacerbated by some asshat who thought it would be fun to drive recklessly through the area, and when pulled over by police declare he had a vehicle loaded with explosives. Now I know why long term Hollywood residents hate the Oscars. Parking is now banned on what is left of the strip; and, these spots have been filled by police cars and parking enforcement vehicles. Way to ruin it for everyone, asshat! Midweek the red carpet was rolled out. This made me wonder what they do when it rains. All the carpeting inside the buildings (e.g. 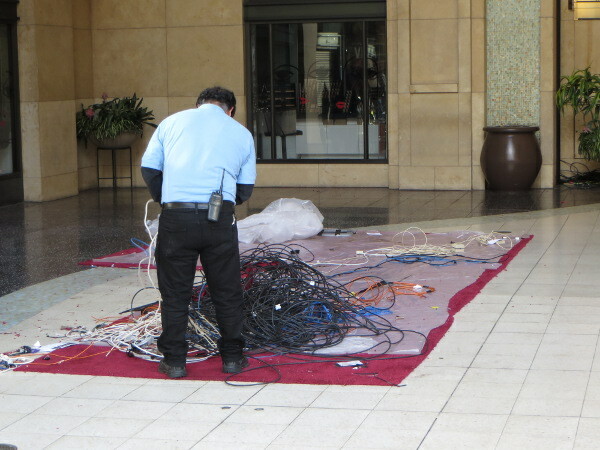 in the Dolby Theatre and on the stairs) is covered in plastic to keep in clean… but not the carpet outside. From what I could see, it was exposed to the elements. On one afternoon, while walking I overheard one couple asking the question: Who is Oscar? This is the 87th ceremony. The stars will arrive through a large plastic covered gazebo. Bleachers are set up in the gazebo for spectators… spectators of what I wonder (it’s not like someone is going to break out and make a touchdown in the middle of the event). Does someone pay exorbitant amounts of money to be able to watch someone walk by? I guess you could equate this to one really big, expensive fashion show. And, there are spectators at fashion shows. I’m staying at the Roosevelt this week because of luck and timing. Generally, people like Oprah will book entire floors at Loews or the W and use this as the headquarters for preparation for the ceremonies. This is common practice and because of it, hotels in Hollywood are booked solid in the days around the Oscars. I lucked out because I work with an agency that reserves blocks of rooms at various hotels… well in advance. However, by Wednesday I wouldn’t call any of this luck. At some point in the night or early Thursday morning (i.e. 1am), the fancy cars, photographers, loud parties, and snotty people started to arrive at the Roosevelt. The person driving the green Lamborghini below had difficulty driving this fancy car and managed to hit a bunch of stuff in the parking lot while attempting to park. It could be that he/she was distracted by photographers. I’m also not sure if the driver was the owner or the parking attendant. If it was the later and this was my $400,000 car, I’d be pissed when I discovered the damage. All the cars in the parking lot were removed at some point because at 4am the trucks started to appear. I know it was 4am because there is nothing quiet about a large truck trying to park. This noise, combined with bomb threats, the inability to move about freely, and the open ostentatiousness meant that I was extremely happy to walk out of the Roosevelt on Thursday morning, knowing I would get a better night’s sleep at the Marriott and that I’d be in another country in the days leading up to the event. To answer my own question about what do they do to the carpet when it rains…? Well, nothing. There was a torrential downpour during the Oscars and the red carpet became a wet, soggy, gross, mess. 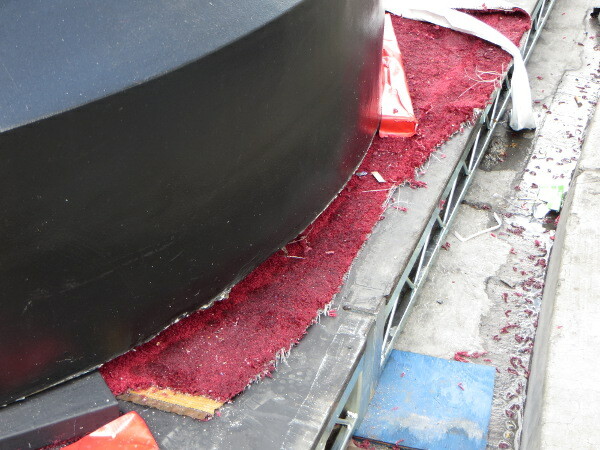 And, I discovered this after: the carpet is disposable. It was cut up, ripped out, and discarded after the ceremonies. In fact, workers worked all night to clean-up and remove all the scaffolding and such. I was told by an employee that they need to move quickly, because they pay the businesses impacted by the set-up a large chunk of money for their loss in revenue. And, the Academy doesn’t want these payments to continue for very long.